Fishing the Brisbane tubes near Sierra Point in Brisbane can be very productive during the spring and fall. Often this West Bay spot can be the only place in the area that will produce Striped bass consistently even when the fishing reports say things are not favorable. Timing the tides near the Brisbane tubes is probably the single most important aspect to fishing this area. Over the years I have kept tide logs that have guided me as to when the tubes will turn over, and begin the outward flow toward the main bay. What makes the tubes a very good striper fishing spot? 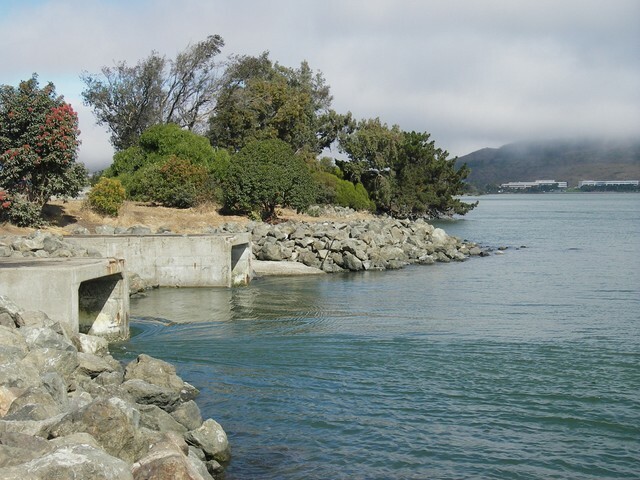 There is a lagoon on the west side of Highway 101 that was created to connect growing South City and the peninsula to San Francisco. There are two tubes that connect the man bay with the Lagoon that create fast flowing water. Smelt and other bait-fish such as shiner perch frequent the area as early as February and hang out through November. The abundance of bait-fish create an Ideal atmosphere for striped bass and halibut to feed. I have fished this area for stripers since I was fifteen and on more than one occasion large runs have taken place that include 40-50 fish days for 10-15 fisherman. The best spot for striper fishing is the outside of the tubes in the main bay during the outgoing tide and the inside of the lagoon on the incoming tide. The inside of the lagoon is more popular because of the easy access, though watercraft are prohibited on the lagoon. Tides- As I mentioned the tricky part is timing the tides. I will usually try launch before the tide turns (outgoing) so I can make bait without a fast flowing rush of water. (I usually drive to the lagoon which is only a minute away to see how close the water is flowing out of the tubes.) This allows me to optimize the amount of time I have to fish the area without losing my landing options at the Sierra Point cove. I have also found that right when the tide turns stripers usually flow right out of the lagoon following the smelt. There is a 45 minute tide differential from the Golden Gate to Oyster Point. I have found the tubes usually take closer to an hour. Making Bait- I usually troll the area but it is not too difficult to make bait. If you manage to launch before the flow becomes too strong you can make bait three ways. You can find bait balls of Smell on your fish finder and use a sabiki. These bait balls are usually in tight to the rocks around the tubes, thus the lower the out flow of water the better when making bait. Secondly you can land your kayak and walk to the rocks around the tubes and throw a cast net. This is what the guys who fish from shore do. Lastly you can jig up some shiners about 40 yards from shore near the south tube rocks. A fish finder or experience will be necessary for this option. What bait or lure options work best? I recommend that you use what you are confident using. My lure of choice is a _ ounce white hair- raiser with a curly tail, about 5 inches long. I try to troll this as slowly as possible but just enough to keep it off the bottom. You will have to vary your speed when passing by the tubes because sometimes you will battle the current and sometimes you will be going with it. Trolling - When you launch you can troll the shoreline directly along highway 101, however if you don’t launch right at the turn of the tide or just before I don’t recommend it. Often you will get snagged on the many large rocks in the area if the water is to low. When you reach the tubes I recommend trolling as close to the tubes as possible. At this point you will be facing north toward Candlestick. Often I will troll 20 yards past the second tube and then make a figure 8. Often when I make my figure 8 and begin to pass along the north tube I get a hook-up right when my lure enters the outward flow of water. I continue to troll the tubes in the same manner but vary how close I get to the rocks. Sometimes I will go out by the end of the flow and work my way back. All these places have produced fish. Are there any obstacles? Yes, there are a few things to keep an eye on when fishing the area. The southern tube has a lot of rock structure just before you pass over it into the water flow. I like to fish this spot because not only do the fish like the structure but the bait-fish such as shiner perch are abundant. This spot can be tricky so most of the time I have to speed up my troll to avoid a snag. Keep your eye out for other anglers. Usually 2-3 people will make the fifteen minute walk out to the main side of the bay and fish with bobbers. Often times these bobbers will stretch many yards out from the tubes and create a trolling hazard. Most people compromise but on one occasion I landed my Kayak and got into an argument with a guy who allowed his bobber to extend at least 75 yards across the tubes, hampering the troll. Last but certainly not least watch the tide. The water gets low very quickly in the cove and outside of the tubes. On my last trip out I was having so much fun catching fish that I forgot to keep and eye on the tide. On one of my last passes over the tubes I noticed I was fishing in about one foot of water. I raced back to the launch only to find that the landing was now at least a 20 yard walk in the bay mud. Not feasible in the best of conditions! I had to carry my Kayak over a rock wall and that nearly ruined my experience for the day. The best times of the year to fish the tubes for stripers are late February, March, April and May. March, April and May are usually the most consistent and produce the best chances for catching fish. April is probably the best month of all. In late May and June I usually begin to fish Oyster point for Halibut and stripers. I don’t normally fish the tubes in the fall but if you hear reports of stripers in the area along Candlestick, Oyster Point or Hunters Point you can bet they are at the tubes! Equipment- I like to use a 8ft medium action rod with a conventional real. I will usually use no more than 12 pound mono but sometimes use fifteen if I am a going to stray off for some Halibut. Trolling rig- I will usually use an eighteen inch leader with a clasp at the end to hold the hair raiser and allow for a quick change of lure if the fish begin to bust on the top. This leader is usually 12-15 pound mono and acts as a shocker against the hard strikes of the striped bass, especially when you are going against the current. When bait fishing the tubes I usually use a 3 foot leader with a _ ounce egg weight, I may use _ if the flow is really strong toward the bottom of the tide. Nose hook a smelt and troll away. For Halibut I usually put on a 1 ounce egg sinker and drift around, the water is only 15 feet in the deepest area near the tubes. However if you fish for Halibut in deeper water remember to adjust you weight appropriately. Launching- Launching at the tubes is probably easiest when the tide is high. The launch will vary depending on how high or low the tides are. You can launch in the cove near the Tsing Tao building or better known as Hitatchi cove. I would recommend using Kayak wheels to aid in your launch, but I don’t have any so it is possible to do so without. If you don’t you will get a little work out. You will have to carry your kayak down a little hill and then over some rocks and clam shells. Be carefully not to drag you kayak too far or you will get many scratches on the bottom. Enjoy fishing the tubes and good luck!